Introducing the shortest tri/mono/whatever-pod I've ever used and, likely the shortest I'll ever use, the NatureScapes Skimmer Ground Pod II. The ideal height to photograph birds and other wildlife from is often at their level. But, when those subjects are short and they are on the ground, getting to their level can be a bit challenging. That is where the NatureScapes Skimmer II Ground Pod comes in. The Skimmer II's design is very simplistic. 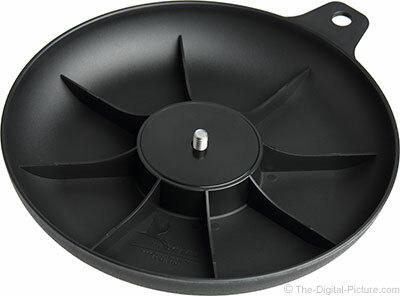 It is essentially a reinforced plastic dish with a bolt recessed into the bottom of it. Attach a tripod head or quick release clamp to the bolt and you are ready to mount your camera or better yet, your lens to the ground pod. The 15 oz (425g) Skimmer II measures 10" (254mm) wide, providing a stable shooting platform. 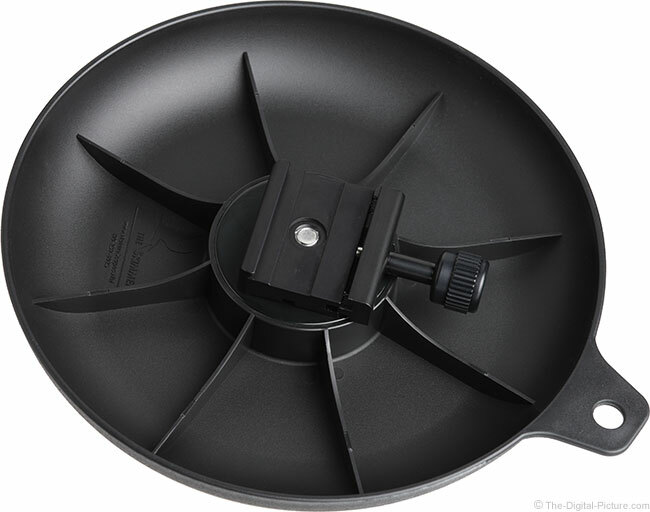 The 1" (25mm) depth makes the sides of the Skimmer high enough to help avoid sand, water and mud from spilling into the dish and to prevent the ground pod from digging in when being slid around. A 3" (76mm) wide raised area in the center provides a mounting platform and secures the flush-mounted, captive 3/8"-16 threaded (standard size) bolt. Eight reinforcement fins make the design rigid enough to plow through uneven sand, grass and mud while enough flex remains to avoid breakage under hard impact (or to avoid denting things that come into contact with it). Being plastic, this ground pod will not rust or dent and it is easily cleaned. Overall, the Skimmer II appears nearly indestructible. A reinforced loop is provided for attaching or hanging the Skimmer. I clip the ground pod to my camera backpack via a carabineer while not actively using it. Note: clip it high enough that it does not swing into your legs while walking. Which Head to use with a Ground Pod? The what head to use on a ground pod question has a lot of answers. Almost any tripod or monopod head and any quick release clamp can work. Directly mounting a Wimberley C-10 quick release clamp or similar is a great option I had an unused, unthreaded Arca-Swiss quick release clamp on hand, so I had a local machinist tap threads into it for direct mounting to the Skimmer. The clamp gives me a very simple method for quickly attaching a camera or lens to the ground pod and places the lens as low to the ground as possible. Ball heads and monopod heads will raise the lens a few inches and for more height, a Wimberley RB-100 Riser Block can be added under the selected head or clamp. For big lenses, the Wimberley Tripod Head is a great option. Working from the Skimmer II is easy (aside from my neck being bent back rather far when looking through the viewfinder). You simply lay flat on the ground and push or pull the Skimmer-supported camera to where you need it – the round design making it direction agnostic. You can simulate this body position: lay down on the carpet in your living room and, while resting somewhat on your elbows, raise your hands as if they were holding a DSLR to your eye. Since the ground pod takes all of the weight, no camera is needed for this simulation. Note that, if vertical shots are on your to-capture list, a battery grip is especially helpful when working from the ground. You can simulate the without-grip vertical camera use also – raise your right elbow high into the air while in this prone shooting position. I assure you that this position is not nearly as comfortable. The downside to using a battery grip with the Skimmer II is the clearance issue with smaller lenses having low profile tripod rings used in a clamp-only setup. My 100-400 L II mounted to a 1D X body with an L-plate requires the setup to be mounted well behind the balance point so that the camera clears the ground pod. Removing the camera's L-plate allows clearance, but rotating the camera requires removal from the clamp. Use of a riser and any tripod head resolves this problem. The closest alternative to the NatureScapes Skimmer Ground Pod II is probably a do-it-yourself option. Buy a cheap frying pan, drill a hole in the bottom and epoxy a bolt into it. While the frying pan option has the lower cost advantage and has the benefit (?) of a handle, the Skimmer II is a far more elegant device that is significantly lighter (weighs about 1/2 as much) and doesn't have a bolt head catching on whatever is underneath. The significantly lighter part is especially helpful when traveling by air and when carrying the device, either in the pack or attached to the camera or lens. The plastic construction also make the Skimmer II less damaging when it comes in contact with other objects including your camera gear (and you), though the pan would make a better personal defense item. The frying pan pod, if a steel pan model is selected, is far more likely to rust, especially when used around salt water. 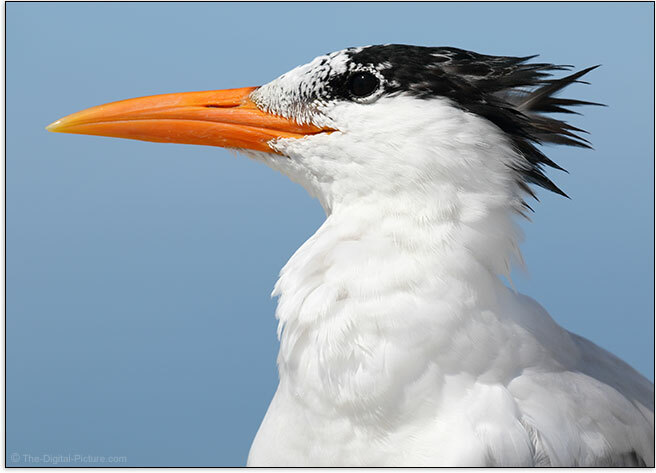 The royal tern image was captured using the Canon EOS 7D Mark II with an EF 100-400mm L IS II Lens mounted. The sharp shells in the Captiva sand left some minor scars on the bottom of my Skimmer, but the avoidance of those cuts on my hands alone was easily worth the price of the Ground Skimmer. Elbow and knee pads will be useful in some circumstances. While great at the beach, the Skimmer II is also designed for use in mud, very shallow water, grass, from on bean/sand bags and from many other surfaces. The low shooting position made easy by ground pods places the background farther away from the subject, allowing the background to become heavily blurred and lacking distractions. In the case of the royal tern shown above, the background became the sky, which is often clear of distractions regardless of how blurred it is. The low shooting position also provides an ideal perspective for photographing ground level small birds and animals. If these subjects are on your to-photograph list, be ready to shoot from a very low position. I am not aware of a better option for making that low shooting position possible than the NatureScapes Skimmer II Ground Pod.